For once, Los Angeles got the jump on New York. Oh, now, before those of you on the West Coast get all worked up, I’m just talking about Fashion Week, the women’s portion of which kicked off in New York on Wednesday night with Tom Ford making a great case for his pragmatic vision of elegance. But that wasn’t quite the opening statement on the season, as Kate and Laura Mulleavy of Rodarte made a bold move of their own, having already shown their fall collection the day before in California, at The Huntington, a picturesque property made up of mansions, art installations, and botanical gardens in San Marino, near where the sisters grew up in Pasadena. And there was nothing practical about either their clothes — magical, almost cinematic gowns clustered with sequins and ribbons — or the show, which happened to be terrific. Fashion seems to be branching into several directions at once, and these are just two forks in the road. Ford has been on a mission to move the needle in a more serious-chic direction, away from all that ironic streetwear out there. The Mulleavys, representing a next generation, have embraced a more improvised approach, although the DIY aspects of their early collections have given way, over nearly 15 years, to more mature and ethereal visions, ultimately winding up in territory once traveled by Ford himself. That would be Old Hollywood. Growing up in such proximity to Hollywood likely had a strong influence on the Mulleavys, who have dabbled in film in addition to their fashion collection. Their pals, well represented at the show, include Brie Larson, Tracee Ellis Ross, Marisa Tomei, Kim Gordon, Rowan Blanchard, and Diane Keaton. And while their work has often made specific references to films (who could forget their Star Wars dresses from Fall 2014? ), the Mulleavys chose their homecoming show to make a much bigger statement, with dresses that paid homage to the glittering styles of bygone musicals, as well as ceremonial styles and even some tropical colored fiesta extravaganzas. And it was a smash production, held in the round under a glass covered atrium, which seemed designed (successfully) to put the designers on another level. The trio of bright ballgowns, in pink, citron, and cobalt, were intricate wonders, the last, with a giant blue bow on the backside, requiring more than 12 hours of fittings alone. It was fashion as fantasy. 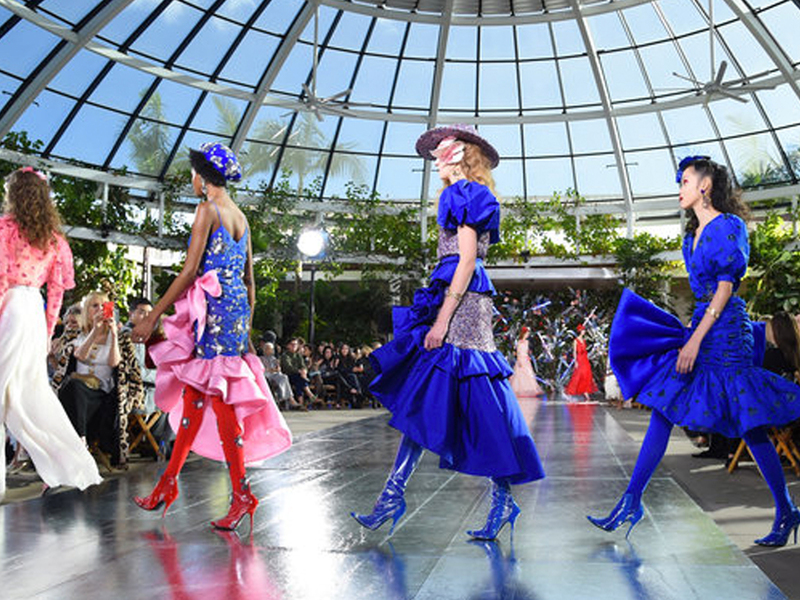 It’s no secret that Rodarte is a small, independent brand, facing the same challenges as all youngish designers, but it was telling that Brian Phillips, who runs the PR firm representing them, took to Instagram the following day to argue that the sisters deserve a bigger place in the industry, a shot at one of the big houses of Paris or New York. Of course, one could argue that’s not the shiny brass ring it once was, but the financial security would be nice. As it was, Rodarte was able to create such a big event in LA thanks to a sponsorship deal with the maker of a new rosé wine called JNSQ, directed at millennial women (the motto is “She’s got that… JNSQ,” which helps explain the name). And it seemed a perfectly respectable match. Back in New York, Ford, the king of brass rings, had celebrities to spare (Courtney Love, Odell Beckham Jr., Joe Alwyn, etc. ), watching his fall collection, which the designer noted was a continuation of his renewed approach to conscious dressing, making “clothes that enhance the wearers’ lives.” Ford is at a stage in his career when he can justify a more quiet approach to the runway, as his loyal customers are already tuned in, but it would be a mistake to underestimate just how many women are out there searching for clothes that don’t look so … runway. If you take away the funny faux fur hats from Ford’s show, you’d find plenty of great choices, the divine crimson velvet blazers (paired with satin trousers and turtlenecks in lightly clashing colors, like a lipstick display), black leather separates, and some of his specialty — those sensuously slinky, monochromatic gowns, this time trimmed with heavy chains. Black, white, and gold were the primary elements of Ralph Lauren’s collection, actually for spring, as he’s one of the few designers to show in season, just as the clothes are coming into stores. Lauren invited guests to breakfast on Thursday morning at one of his stores on Madison Avenue, where he has opened a café that serves some fine croissants — though try not to eat to many of them as his dresses also took a turn for the body-con. The gold looks — a gold leather coat, a gold blazer, a patent gold handbag — all matched the Ralph’s logo on wall, which certainly looked right at home on the ritzy Upper East Side. He’s one designer who knows how to create an atmosphere, right down to the coffee grounds. This article was written by Eric Wilson from InStyle and was legally licensed through the NewsCred publisher network. Please direct all licensing questions to legal@newscred.com.